AFTER the disappointment of missing selection for the Beijing Olympics in 2008, USA swimmer Dana Vollmer came to Australia last October to start preparing for the London Games. Desperate to regain the form which saw her win 2004 Athens gold in the 4x200m relay, the statuesque 24-year old left behind husband of two weeks Andy Grant and took up residence in a house overlooking Woolgoolga Headland. Her housemates knew more than a little about swimming. 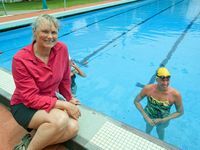 They were Shane Gould and her American-born husband Milt Nelms, close friend and triple-Olympic backstroker Noriko Inada of Japan and up-and-coming open water star Michael Havenar. 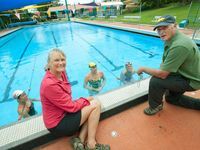 And so the ocean waters off the Coffs Coast and Woolgoolga's public swimming pool ultimately produced an Olympic gold medal-winning champion, even though it wasn't destined to be an Australian standing on the podium. Starting the week in London, Vollmer claimed an individual gold medal in the 100m butterfly and broke the world record with a time of 55.98 seconds. 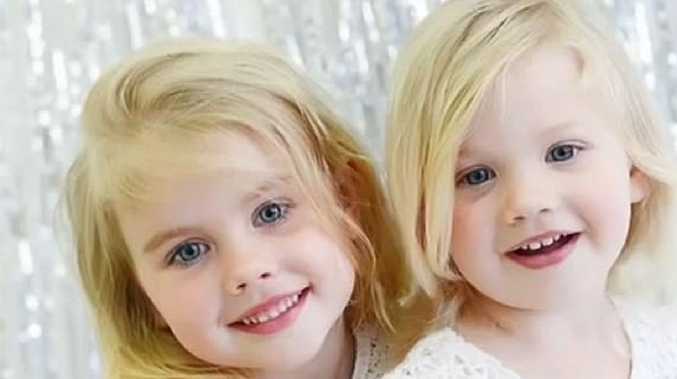 On Wednesday she swam the second leg of the 4x200 freestyle relay as the US swim team won the gold medal and set an Olympic record in the process. Back in October, the tall blonde newlywed spoke about "falling in love again" with the water during her trip down under. "My coach (Teri McKeever) suggested I come to Australia as he has worked with Milt over the years and trusted him to find something extra for me," she said. "Since Athens I've done the world championships a couple of times and been successful but there were times it became grinding. "The difference has been swimming in the ocean. "At first I wasn't so sure it was the thing to do but from the moment I got into those waves and felt the water on my body, I knew something was happening. "Training has been enhanced, particularly in the ocean, and I'm more confident and aware of the environment I'm in. "I can take the program back to the US team and share what I've learned." Gould admitted to being a huge fan of her American charge. "It's astonishing to see Dana's beautiful style as she butterflies into a wave and honestly, we had never seen a surfer use a backstroke until the day Noriko headed into the ocean," the Aussie legend said. "We have a house on the headland where we can look out the window and see which way the surf is heading. "If the surf looks good we go down there or if not so good, head down the road to Woopi pool. "The swimmers are spending two weeks here so they can not only train in the pool and on land but head into the ocean as part of their preparation. "Milt stands and watches out of the water and sees things in swimmers others can't see. "Numbers are very important in this sport but so is the sensation you have to feel while you are in the water. "It can be stroke or technique but is best when they feel as close to natural as possible." And then Gould made an extraordinary prediction. "Dane surprised how well she adapted to the ocean, there's something there that's hard to put a finger on, and I think this could be something that completes her in the next few months as she prepares for London." In the months since October, the now 34-year-old Norika Inada missed making the Japanese team for her fourth Olympics by just 0.04 seconds. Last April, Michael Havenar broke into the top 20 of USA High School swimmers for the first time and is seen as a future Olympic prospect in distance events. Today she is chasing a third gold medal with the US team. On Friday she tweeted: "Saved the best for last ... the 4x100m relay ... it's going to be amazing ... let's go ladies."